The excavation work that started on Saturday in search of ‘hidden treasure’ at a house of Mirpur-10 in the capital was postponed on Sunday to avert the possible risk of the building collapse. “We’ve postponed the excavation mission to avert any untoward incident,” said Tajwar Akram Sakapi Ibne Sajjad, Executive Magistrate of Dhaka District Administration. 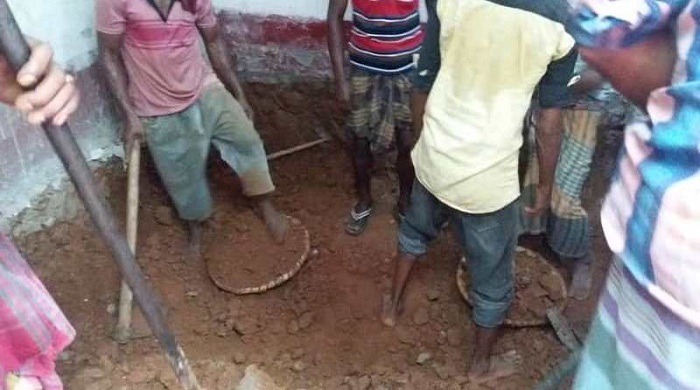 The digging work started around 10:30 am on Saturday at the house of Monirul Islam at Road-16 (Block-C) of Mirpur Section-10 in the presence of executive magistrate Md Anwar Uz Zaman as two GDs were filed with Mirpur Police Station earlier about treasures remained hidden beneath the house. Later, the digging was wrapped up around 3:30 pm for the day and it was scheduled to resume today (Sunday) morning. Contacted, Executive Magistrate Tajwar Akram said an executive engineer of the National Housing Authority opined that there is a possibility building collapse and loss of lives of labourers if digging work continues without taking appropriate measures. “We’ll write to the authorities concerned to examine whether there’s any possibility of the presence of hidden treasure in the house. If we can confirm it, then we’ll resume the excavation work taking all safety measures,” he added. Officer-in-charge of Mirpur Police Station Dadan Fakir said the executive magistrate has already put the house under lock and key and an adequate number of policemen will guard the house until further decision. Monirul Islam, who is claiming himself as the present owner of the house, said he got information of the hidden treasures from its previous owner who is a Pakistani national. Monirul filed a general diary with Mirpur Police Station on July 14 about it. Meanwhile, the other GD was filed by Abu Tayab, a cousin of the Pakistani national. After the GD, some policemen were deployed to guard the house and then the digging work stated in presence of the executive magistrate on Saturday.